This entry was posted on September 4, 2015 by Texas Safety Supply. 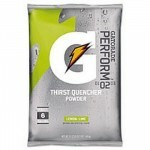 Lemon Lime Gatorade Powder flavor is rich in carbohydrates and electrolytes. It will help your workers to stay hydrated for long time periods, thereby ensuring them to work efficiently. Lemon-Lime gatorade powder will assist them to maintain their performance in their workplace by ensuring the rapid absorption of electrolytes into their bloodstream. This will prevent muscle fatigue and dehydration during physical exertion over long hours. 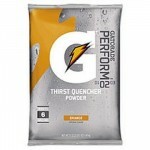 Orange powdered Gatorade has been prepared specifically for industrial use. It is a good source of electrolytes and carbohydrates and will ensure that employees remain hydrated while working under hot, humid conditions. It will help them to maintain their performance by ensuring the rapid absorption of electrolytes into their bloodstream. As a result, they won’t experience muscle fatigue while working over a long span of time. It's fruity tang will offer them with the much needed freshness they require as a respite from the heat. 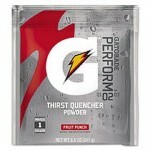 A perfect combination of different types of fruits, the 6 Gallons of Fruit Punch Powdered Gatorade is meant for the ‘industrial athlete’ who is exposed to the hot summer son in Texas. An excellent source of carbohydrates and electrolytes, it will keep your workers up and running for long hours. The electrolytes will mix quickly in their bloodstream, thereby checking possibilities of dehydration and muscle fatigue. So, they will be enabled to perform their job duties in a safe and efficient manner. As timely project completion remains a priority in the construction industry, you cannot afford to let your workers succumb to dehydration. Therefore, count on Gatorade to help your workers stay fit and active.